Living descendants of John C. have the oral tradition passed down that John immigrated from France. At the time of his arrival in Virginia, the residents of the Isle of Jersey spoke a Norman French dialect as their native language. Research to date has not pin pointed where in France John came from. Throughout known history, there have been Poingdestre/Poindexter families in France, especially lower Normandy. Our earliest records go back to the 12th century in the Bayeux district of Normandy. These records are older than any Poingdestre records found to date on or for the Isle of Jersey. It has been reported John C. served throughout the Revolutionary War under Washington and was present at the surrender of Cornwallis at Yorktown. We need to search for records as we have none on file. There is also a statement that John and his wife Elizabeth Thomas were members of County Line Baptist Church in 1792, possibly in Sullivan or Blount Tennessee. He resided in Hawkins County, Tennessee. NOTE: The more direct male lines coming down from John C. POINDEXTER we can add to our DNA project, the more complete and accurate picture we will be able to create of the John C POINDEXTER family tree. Through our DNA project, we have also positively identified a second large group of Poindexter descendants that descend from a John C or Jean C. (some show name as Jan) Poindexter who is believed to have either been born in Virginia between 1750 and 1755 or emigrated to America from France early in life and married Elizabeth Thomas in Virginia. Because many family researchers believed the surname Poingdestre was anglicized to Poindexter when George immigrated to America, they also concluded that all Caucasians born in America, bearing the Poindexter surname, descended from George. DNA has shown us this was an incorrect assumption. John C. Poindexter’s youngest child was Samuel Wiley Poindexter, who was born in Tennessee and married Dorothy Turley/Turrell Keck. For years many researchers tried to attach Samuel Wiley to Bond Veale Poindexter who much latter in life married a second time to a Rachel Patton. DNA conclusively proved their line of thinking was in error and positively reattached all the descendents of Samuel and Dorothy to their correct lineage. 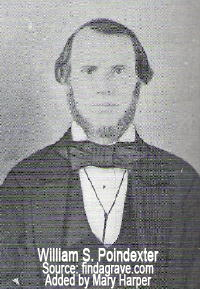 Another line of John C. Poindexter’s, through his grandson, William S. Poindexter, born 9 February 1812 in Hawkins County, Tennessee, mistakenly identified William’s parents as Robert Poindexter and Sarah Slaughter. This lineage had shown William S. coming from George, George (maybe only one George), Thomas, John, Thomas and then Robert. DNA proved that was not possible. Subsequently, we were able to locate William S. Poindexter’s real parents. We have descendants of two of Samuel Wiley Poindexter’s sons, Christian and MacHewell “McHugel” participating in our Poindexter DNA Project at present. We would love to add more descendants from Samuel’s other son Samuel Wiley Poindexter Jr., plus, both Christain and MacHewell had several sons, all of whose descendants could add much to the growing tree of John C. Poindexter. Our other John C. Poindexter lineage participant comes through Samuel’s brother, Thomas. Additional brothers of Samuel and Thomas which we have been able to identify are Morgan, William, James, and John. If you come down any of these lines, we would be delighted to have you as part of our DNA research group. Should you know or come across someone who comes through John C., please let them know about our DNA project. This information provides some of the DNA test results that led to the investigation into an immirant that wasn't George Poindexter I and subsequently led to John C. Poindexter (also now designated as John I as the first genration in America of his descendants). Samuel was born 23 May 1807 in Claiborne County, Tennessee. He marrried Dorothy Keck and he died in Brown township, Martin County, Indiana. Before DNA testing for genealogy was available, the PDA had surmised that Sam's parents were Bond Veale Poindexter and Rachel Patton. We believe Bond is descended from immigrant George Poindexter I. However, DNA has indicated that living descendants of Sam have a marker distance great enough to state that they do not descend from immigrant George. So we have a mystery and a second immigrant Poindexter which we currently believe to be John C. Poindexter. Two people that have tested their DNA match each other with a genetic distance of only 3. They both have traced their paper trail to two brothers, Christian and MacHewell "McHughel" Poindexter. The parents of these two brothers are Samuel Wiley Poindexter and Dorothy Keck. Our first Samuel Wiley Poindexter DNA descendant came down from Samuel's son Christian. Christian was born on 18 Nov 1825 in Claiborne County, Tennessee. He died on 26 Mar 1885 in Odom, Martin County, Indiana. He was buried in Burns City, Brown township, Martin County, Indiana. Christian was counted in a census on 16 Sep 1850 in McCameron, Martin Co, Indiana, United States. He was also enumerate in the 1860 census. Our second participant comes down Samuel Wiley's son MacHewell Poindexter. MacHewell was born on 27 Mar 1838 in Claiborne County, Tennessee. He died on 23 Oct 1881 in Lawrenceville, Lawrence County, Indiana. He was buried after 23 Oct 1881 in Lawrenceville cemetery, Lawrenceville, Lawrence Co, Indiana, United States. He married Elizabeth Catherine Faith on 12 Nov 1857 in Brown twp, Martin Co, Indiana. At 37 markers, our second Samuel Wiley DNA participant, who has a proven lineage back to Samuel Wiley Poindexter and Dorothy Turley/Turrell Keck, matched with a genetic distance of 3 to the other Samuel Wiley descendant DNA participant. This means that within the 37 marker test, they have only 3 markers that are different from one another. Unequivocally, this gives us a different group of descendants coming down Samuel Wiley Poindexter's line, which is distinctly separate from those who descend from immigrant George Poindexter 1 of the Isle of Jersey, yet are closely related to one another. At this time, the earliest proven ancestor of our third participant in this same genetic group for whom we have been able to verify connections is William S. Poindexter. He was born 9 February 1812 (about 5 years after Samuel Wiley), in Hawkins County, Tennessee. He died on 14 Sep 1865 in Livingston, Polk Co, Texas. He was buried on 17 Sep 1865 in Mainer Family cemetery, Colita, Polk Co, Texas. William married Mary Matilda/Mathilda Mainer, daughter of William Mainer and Sarah Ann Reams on 5 Oct 1842 in Cheneyville, Rapides Parish, Louisiana. Mary was born on 20 Sep 1817 in Caney Creek, LA. She died on 17 Dec 1899 in Livingston, Polk Co, TX. She was buried in Livingston, Polk Co, TX. During William's lifetime he moved from Tennessee to Louisiana and then, in 1846, during the days of Texas Independence, to Polk County, Texas with some of his Louisiana neighbors. There he was a Justice and a captain of the Militia. He also served as a deacon of Bethel church. A public auction of his mother-in-law’s possessions took place following her death, at which William purchased three slaves, three books and a large map. Our first Samuel Wiley DNA participant matches the William S. DNA participant with only a genetic distance of 1 (one marker deviation) on the 25 marker scale. Surprisingly, on the 25 marker scale, his genetic distance from the other Samuel Wiley Poindexter descendant is 3, which would normally indicate a more distant connection than that of the William S. descendant. The William S. Poindexter descendant's proven paper trail is positive proof he did not descend from Samuel Wiley Poindexter, therefore the three must have a common ancestor further back. Poindexter DNA Project at FamilyTree DNA. Robin Daviet, Research Committee, Chair. NOTE: These may still indicate their father as Bond Veal, which is now proven incorrect by DNA.